The Meg (film, 2018). A 2018 science fiction thriller film with "PG-13" rating by Warner Bros. Pictures. Directed by Jon Turteltaub. Official Trailer. The Meg is a 2018 science fiction thriller film directed by Jon Turteltaub. 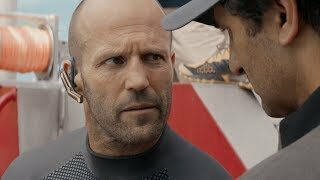 THE MEG - Official Trailer #1 . Jonas Taylor, a rescue diver, attempts to save a group of scientists in a damaged nuclear submarine. As Taylor is rescuing the last survivor, he sees the hull of the submarine being rammed in by a giant creature. When he returns to the rescue vessel, two of his crew are trapped in the damaged submarine; Taylor leaves, realizing that attempting rescue would result in the death of everyone. Moments after leaving in the rescue submarine, the damaged sub is destroyed in an explosion. Taylor's account of the story stating that a giant sea creature was the cause of the disaster was dismissed by Dr. Heller, who believes that Taylor was affected by pressure-induced psychosis. Five years later, billionaire Jack Morris meets Dr. Minway Zhang at an underwater research facility called Mana One, which Morris finances. Zhang and his daughter, Suyin, an oceanographer, are supervising a mission to explore what may be an even deeper section of the Mariana Trench concealed by a cloud of hydrogen sulfide, forming a thermocline. The mission is being conducted by Lori, Taylor's ex-wife, and scientists Toshi and "The Wall" in a submersible. The mission appears to be going well until a very large creature collides with the submersible and causes it to lose contact with Mana One. James "Mac" Mackreides, another crew member at the station, suggests sending Taylor down to attempt a rescue, citing the similarity to his story. Despite Heller's objections, Zhang and Mac decide to travel to Thailand and recruit Taylor. While they are away, Suyin attempts the rescue herself by taking a submersible and diving beneath the thermocline. Her sub collides with the large creature before being nearly crushed by the tentacles of a giant squid. A giant shark attacks and kills the squid, saving her. Before the shark can attack Suyin, Taylor reaches them in a submersible and distracts it with underwater flares, then orders Suyin to return to Mana One. Taylor attaches to the damaged submersible and saves Lori and The Wall. However, when the giant creature returns to attack the subs, Toshi sacrifices himself by closing the hatch door, allowing Taylor, Lori, and The Wall to escape safely while he diverts the creature's attention to his sub. Principal photography began on October 13, 2016, in West Auckland, New Zealand. The film The Meg was scheduled to be released by Warner Bros. Pictures on August 10, 2018 (United States, United Kingdom) and on August 30, 2018 (Germany). The duration of the film is 113 minutes. With a budget of $130 - 178 million, the film grossed over $530.2 million. The Meg got average rating from critics. The audience dislikes the film either. Audiences polled by CinemaScore gave the film an average grade of "B+" on a scale ranging from A+ to F.